STARRING Rutger Hauer, Sylvia Kristel, David Rappaport, Rita Tushingham, Andr�a Ferr�ol, Kees Brusse, Liesbeth List, Fons Rademakers, Marina de Graaf, Adrian Brine, Siem Vroom, Lex van Delden, Vivien Heilbron, Peter Faber. 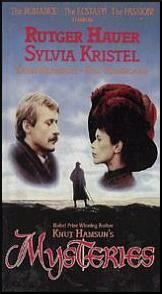 SYNOPSIS It is 1891, when Johan Nagel enters a quiet coastal town. There he is completely unprepared for what awaits him. A stranger, Johan is seen as an arrogant man by the close knit locals. Even so, soon after he arrives, Johan makes friends with the dwarf, Minuut. Friendship, however, cannot save Johan from Dany, a beautiful and influential woman. Johan falls for Deny, but her moods of love and hate drive him insane. In an attempt to forget about Deny, Johan asks Martha Gude to marry him. She accepts at first, but then refuses after Deny intervenes. In despair Johan throws himself into the sea, but revenge is at hand through Minutt.